As far as I am aware, your wife's visa doesn't expiry, as it says on the vignette ...... because you have already exercised your right under the EU Directive 2004/38/EU for yourself, by working, living or studying in the UK over a year....... or more. My suggestion and to make life easier for you, it would be to use the same paperwork that your wife used to apply for her Entrance Visa and make an Application for a RESIDENT CARD, which is FREE now. When your wife make the application for the Resident Card, you have to post them also both your passports ...... but after you receive the confirmation from the UKBA that your application has been received you will see that they also confirms her position regarding work that she is FREE to work too. Then write back to the UKBA and ask for your passports back so you can travel if you need too..... and when the Resident Card has been considered by the UKBA then they will write to your wife and ask for her passport back! Having acquired her Resident Card, your wife can travel without any visa requirement in all the EU countries except the Irish Republic. So go ahead and make the application ..... Takes nearly 6 months before they issue one. 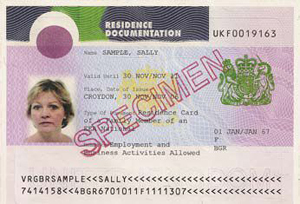 Lastly, would it be ok to apply for a resident card a month prior to expiry of her entrance visa or should we do it now? Can you explain how / where you 'conclude' that a year's compliance to the Directive requirements for the EU/ EEA national is 'completed' compliance..? Teedabus CAN apply for a Registration certificate to re-enforce his status - but it is NOT a legal requirement. *I* suggest you enclose a pre-paid stamp addressed special delivery / recorded delivery envelope and a covering letter with your application stating you want the passports back - as you may wish to travel - we did this and got the passports back with our Confirmation of Acceptance.. this PROVES your wife's rights to work for six months.. helps with applying for college study courses. Wiz - it was be great if you or someone could edit this typo and I'd be genuinely interested in your response re the 'one year is enough' compliance bit .. if that is correct I could stop paying for comprehensive medical insurance... my status in the UK is 'self-sufficient' - as I derive the bulk of my income from outside the UK. Without searching.... I remember when I was preparing my wife's paperwork, that I read somewhere in the form..... established at least a year.....not 100% sure right now. On the other hand I wonder, have you registered your wife and son with a doctor? I never paid for any Insurance and when Hanna arrived.... went round the Doctor's centre with her Passport, entrance Visa..... and our Marriage certificate and no problem. Then we applied for her NI, went to Woking and a week later.....was here. Also I got her the EU NHIcard. Of course she has visited few times the Doctor and used other services for Free. YES they are both registered and have the EHIC medical cards.. If you applied as a Greek National and Hanna is here under you being under self-sufficient status then the UK BA have the right to insist you BOTH have comprehensive medical cover ! When we applied for her Entrance Visa, we used my Freek Passport, stated that I was a pensioner living in the UK for over 30 + years, provided al the required Docs about finances, meetings etc. Visa issued in 24 hours. Both applications made, before the new Guidance Notes issued in July 2009, in June and July 2008. Hanna has been working for 1 1/2 year now and I have all the requirements for a retired person plus my British nationality to confuse them.........LOL .... She was out of work on self sufficient status (supported by me) for just over a year. I get more problems with ignorant airline staff than the UKBA.... frankly I believe if you show them good balance in the Bank... you get little hassle. You appear to miss the point - the Directive makes it clear that if using the self-sufficient status - you SHOULD have sufficient comprehensive medical cover .. The Directive dates back to 2004 and this hasn't changed... If the UK BA have changed their rules then they had better be ready to apply them evenly. If I was in your shoes, I'd do nothing for now, see what happens when the time to apply for permanent residency comes. IF you aren't asked to provide Comprehensive Medical Cover - Great ! In the mean time I suggest you and I both check - as I maintain there is no '1 year compliance, then you are free to do as you please' .. the EEA national must adhere to the requirements of compliance for as long as the non EEA national remains their dependant - up to the granting of permanent residency. If I remember correctly the last means is to be retired.... when exercising your right under the directive. When the application was made..... I was receiving officially a pension and was declared at the time in her application. Not a D*** birt.